I am in the process of building a combination workbench / assembly table for my shop. 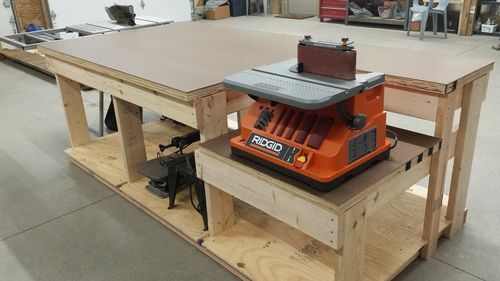 The basic construction of the bench is 2×6 & 2×4 framing with a double layer of 3/4” plywood for a top and a tempered hardboard work surface. My plan is to install two drawers that will hold a variety of items including screws and fastening hardware, handtools and a variety of other items. Given the size of the drawers and how quickly the weight can add up, I would like for the drawers to be strong and heavy duty enough to support the load without sagging or failure – though at the same time economical to construct (thus no fancy drawer slides or hardware). Each drawer will be 30-3/4” wide by 42” deep and 5-1/2” tall. 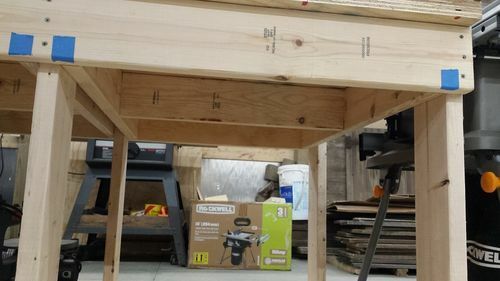 The drawers will be accessible from each side of the workbench and will pull out about 20 inches with the remainder of the unextended drawer supporting the extended section (thus allowing half of the items to be accessible from one side and the other half of the items from the other side of the workbench). The drawers will rest on a full depth support (“A” in the photo) and my plan is to install 1/32” thick “Slick Tape” on the top of each support and/or on the bottom of the sides of the drawer. There is a full depth 2×6 along the top of each side of the drawers to prevent the drawer from tipping and dropping when extended (with enough clearance to remove any swelling & expansion concerns). I would appreciate recommendations on the drawer construction and supports. What would be the best material for the fronts of the drawers, the sides, the drawer bottom, and for the drawer supports (“A” in the photo)? Also what type of construction / joinery would be best, and what type of additional supports would you recommend. I have searched around online but due to the drawer size and the weight of the contents, as well as the use (nothing fancy is needed, just adequate long-term functioning) I wanted to get the insight of anyone here. I would use baltic birch plywood for the bottoms and solid wood for the front back and sides. I would also put dividers permanently attached to the bottoms. They will add a lot of strength to drawers that size. Depending on the spacing between the dividers and the weight I expect to be in the drawers I would use 1/4 to 1/2 inch thick plywood. I have worked with drawers with no slides, also have made ones with European style slides with 3/4 pull out and finally full extension 1 inch over travel ball bearing slides. Hands down the ball bearing slides for heavy loads work best. Like you I wish to spend wisely and found these https://www.gliderite.com/20-side-mount-100-lb-full-extension-drawer-slides-with-1-inch-over-travel/ Buying in packs of 10 saves you a good amount of money verses $12-17 per slide at the box. These are rated at 100lbs, if you put dual slides on this becomes 200 lbs and they slide like glass if installed correctly. 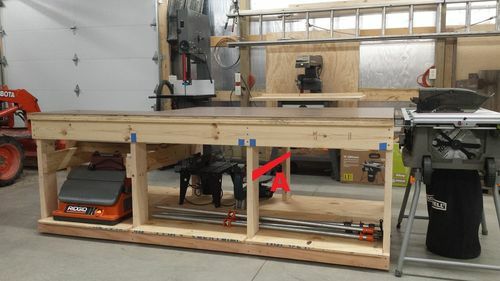 While the idea of a single drawer that passes through the entire bench may seem appealing consider that you are pulling twice the weight since the half you cannot access is also part of your load. This means you have to beef up the drawer as Mike Nolan suggested. 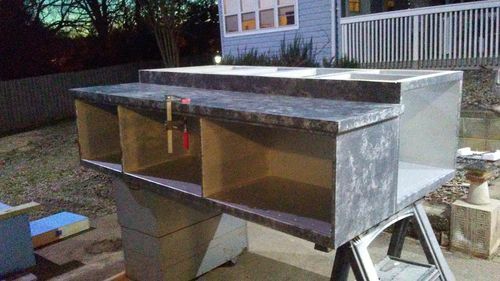 Two drawers at 30 inch Wide x 20 inch deep and 5 1/2 inch Tall would mean 1/2 sides and 3/4 fronts or vice versa depending on what you want. The ball bearing slides even if you used singles would be more than adequate to handle the lesser load and be much easier to use. You mentioned a few items you wished to store in these drawers. Being in the middle of a cabinet build myself I would suggest mapping every drawer with exactly what you want stored, grouping tools and hardware together in groups or in a single drawer. Making the best use of your space. Part of your plan should include what type of storage you wish to use, i.e. hardware boxes from a store or self made ones custom fit. These are merely suggestions, my 2 cents worth. Ultimately it is your project. These suggestions come from years of building my own for my shop. Below are some examples of what I am working on concerning cabinet build and drawer space utilization. My drawers are 24 inches deep, the larger ones are 24 wide and 13 tall or 9 inch tall depending on which side of the cabinet. Anything above 8 inches I put dual slides on, personal preference no spec on this. I have been gathering a lot of great information and the forum has done much to stimulate my thinking, particularly away from my simple & crude, one size fit’s all approach, and is causing me to gravitate toward creating a better quality, more tailored solution. The slides from Glide Rite have a great appeal, particularly with the reasonable price and has me leaning in that direction. 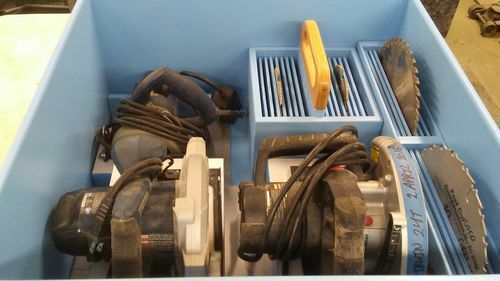 At this point in time the drawers are more of a ‘want’ than an actual ‘need’, and as I begin using the area and determining what tools and hardware I use the most, I will have a better idea of the best configuration – likely a combination of smaller and larger drawers. I might start with a couple cardboard and other boxes to collect things as I work and then determine the eventual plans. I’d rather take things slow and do it right the first time, thank rush and have regrets. The major advantage I now have is the additional knowledge base I am building from the forum recommendations and I truly appreciate the insight and input, it will do much in helping me visualize what to create and it is great to have a resource of great minds to draw from. Thank you for your replies. One advantage of the drawer slides is that they don’t take up much room but they might not be long enough. Something that you might want to look into for some DIY slides are some of the DIY linear rails for DIY CNC machines. For example, these v-rails and associated bearings might be adaptable for use as drawer slides. The rails are pretty inexpensive though the wheels are more expensive. There are other linear rails ideas that might be cheaper but may require more room .